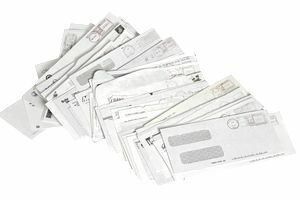 You may have payables (unclaimed checks) you are unable to send to a vendor, over-payments to a customer, a paycheck unclaimed by an employee, or other property that belong to someone else but which your business has in its possession and you don't know how to get this property to the person who owns it. It's important to note that the laws relating to unclaimed property (including paychecks) are regulated by the individual states. The regulations are those of the state where the payee is, not the state where your business is. Make every reasonable effort to find the recipient of the payment so you can give them the money. If you can't find the recipient within a reasonable time, you must report the lack of payment to your state and pay the money to the state, so it's available to the recipient at a later time. Let's say you paid an employee who has left your company and who hasn't cashed a paycheck. You have the money in your business payroll account, but remember it's not your property. Unclaimed property is considered a liability for accounting purposes; that is, it is property you are holding but which is not your company's property. Your business has two responsibilities for unclaimed property: (1) to report and pay unclaimed assets to the right state, and (2) to make sure the company properly reflects the liability on its balance sheet. For bookkeeping purposes, when you reach the point where you must report the unclaimed check to your state, you might want to consider voiding the check and putting the amount into an escrow account. This will help make sure that the funds aren't accidentally spent. You should have already paid the employment taxes on this amount. Keep good all records about this payee or employee and make sure you keep trying to contact the person regularly. The principle of escheat (pronounced "es-cheat" just like it looks) governs here. Escheat means "surrender," and it is based on a common law doctrine that requires unclaimed property be returned (surrendered) to the state, not kept by the person who has it. The idea is that the property is not yours and that the state has more resources for finding the individual or company that has ownership. If no owner is found, the state keeps the property. The kinds of property that might be applicable are checks (including paychecks), escrow funds, customer over-payments, accounts payable you are unable to pay to vendors, payroll checks, and commission checks. The state specifies a period of time of no contact regarding the property. Then annually there is a period of trying to locate owners, mailing due diligence letters to the last known address. It would be good to send these letters by certified mail or "return receipt requested," so you have a record of trying to contact the individual or company. After this period in the year, you must submit a report to the state and a remittance of amounts due to owners who you were not able to contact. Unclaimed paychecks are also subject to escheat laws as unclaimed property. The laws of the state where the employee last worked apply. If you have a paycheck for a former employee or employee which has not been claimed for a period of time, you must follow the same state reporting timeline as for other property. You can search by your state's name and the word "escheat." For example, search for "Iowa escheat laws." You can look on the website of your state treasurer, department of revenue, or taxing agency to find information. Remember, each state has different requirements. Accounting for unclaimed property varies depending upon the likelihood that the property will be claimed. According to the Journal of Accountancy, in many cases, it's best to recognize the loss, from an accounting standpoint, even before you turn it over to the state. Talk to your tax advisor before the end of the year to discuss your list of potential unclaimed property. Find out the laws of your state, or for all states where you have employees working. Pay particular attention to the period after which you must report the uncollected property to the state. Set up policies and procedures to capture information on uncollected property and a timeline for reviewing the list and sending out notifications each year. Then, set a time each year for reporting and paying for uncollected property. Finally, remember that uncollected property is not the property of your company. States can and do an audit for uncollected property, and can assess fines and penalties for non-compliance with state laws.